Create pro-quality piano backing tracks for any song in minutes with the world's only chord-based audio loop app. 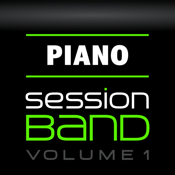 With over 7,000 precision-cut, chord-based piano loops (included) recorded exclusively by Tom Cawley, one of the world's leading pianists, SessionBand Piano - Volume 1 instantly converts the chords you select into great sounding audio - wherever you are and whatever your ability. And with a host of pro features like auto-transpose, one-touch live recording and Audiobus compatibility - allowing you to seamlessly export our unique content into other top music apps like GarageBand - it has never been easier or quicker to create your own studio quality music, even if you can't play a note! SessionBand Piano - Volume 1 is a unique app for songwriters, singers, producers and anyone who wants to quickly create professional piano tracks. * Each of the 22 styles includes 10 chord variations for every root note! * All 7,000 loops recorded exclusively for SessionBand by highly acclaimed pianist and composer Tom Cawley – one of the world's leading pianists. Not only is Tom an in-demand Jazz pianist (Jack DeJohnette, Charlie Watts, Stacey Kent, Ronnie Scott's All-Stars...), he is also one of the most sought-after pop/rock session pianists performing around the world with Peter Gabriel, Andrea Bocelli and many others. * All loops recorded at the famous Bunker studios (UK) on Yamaha S6 grand piano and Fender Rhodes Mark II Suitcase 73. Create great-sounding, real piano tracks on the move.